After delving into the world of moving averages there is no better place to go next than into the world of MACD. Why? 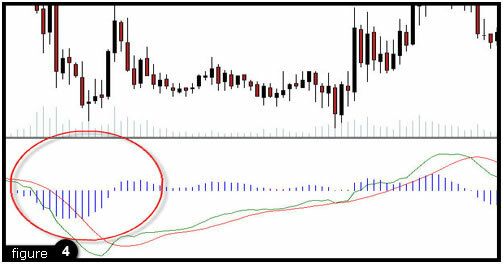 Simple, the MACD is comprised of two moving averages. Some traders argue that there is no better technical indicator than that of the MACD, more often than not, this author tends to agree. 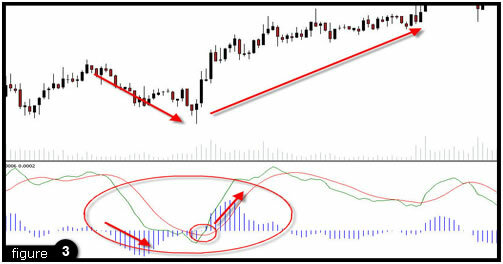 The theory behind MACD is really the same theory behind trading any other form of a moving average cross. Generally a technical analyst can learn more from the interaction of two moving averages than he or she can learn from a single moving average in and of itself. The lines plotted on the bottom of the MACD are trying to tell a story as well, and traders had better listen up! 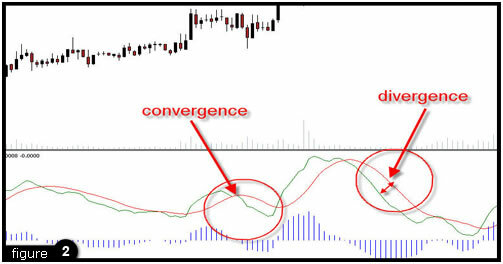 Moving Average Convergence Divergence was not randomly chosen as this indicator's name. 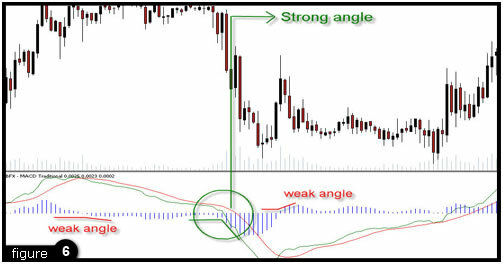 Through the histogram we can visually gauge convergence (moving average lines of MACD moving towards one another) and divergence (moving average lines of MACD moving away from one another). 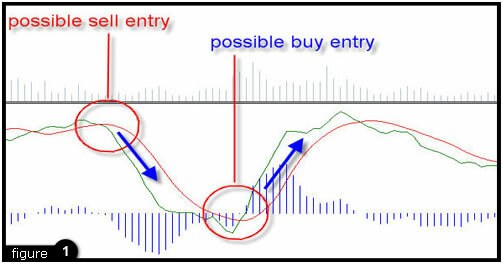 Notice - as the moving average lines cross the histogram will show no lines whatsoever, indicating to traders that lines (prices) should now start in a new direction. Very rarely does the histogram reach the point of a cross (two lines crossing and no line plotted on the histogram) and then plot lines in the same direction as the previous section of the histogram. In other words, if there is a legitimate cross, the histogram should begin indicating a new price direction. 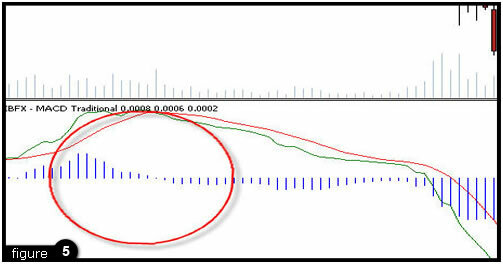 Consider the following strategy: watch the histogram for points where no lines or very small lines are drawn (indicating a cross), then look for strong lines up or down from that point. If after a cross, the histogram begins to plot lines at a sharp angle up or down, such should be considered an indication of a strong directional change in the market. If the MACD crosses, but the histogram plots a series of lines at a weak angle, perhaps the market it momentarily retracing, but overall trends may not be changing. Now take a look at the complete picture, figure 6 shows an example of two trades that should have been avoided on the MACD and one opportunity that shouldn't have been overlooked. The first directional change is weak, lines essentially move sideways. The second directional change is strong, prices dive immediately and just three lines into the histogram a trader wise enough to short the market still has 70 pips left in this downward move. The third directional change is again weak, and is nothing more than a retracement... and indication to the trader that shorted the second move that he or she might want to secure profits... but not enter a new trade.